On October 9, 1860, four weeks before everyone else, the crucial Pennsylvania and Indiana vote went for Lincoln. "Douglas might learn a lesson about what happens when one tries to get people opposed to slavery to vote for slavery. It is not my name, it is not my personality which has driven Douglas out of Indiana and Pennsylvania, it is the irresistible power of public opinion, which has broken with slavery." "It now really looks as if the Government is about to fall into our hands. Pennsylvania, Ohio, and Indiana have surpassed all expectations, even the most extravagant." Results of the election. Lincoln becomes a minority president. "Mr. Lincoln is the next President. We must try to save the union. I will go South." Headline in The Kansas Chief on November 8, 1860, two days after election day reads "WHOOP-EE!" The Raftsman's Journal of Clearfield, Pennsylvania rejoices to Lincoln's victory in its publication November 14, 1860. On November 6, 1860, the rest of the country voted. Lincoln won the Electoral College easily, even though he didn't appear on Southern ballots, but only 40% of the popular vote. This was the worst winning percentage of any president since John Quincy Adams in 1824. 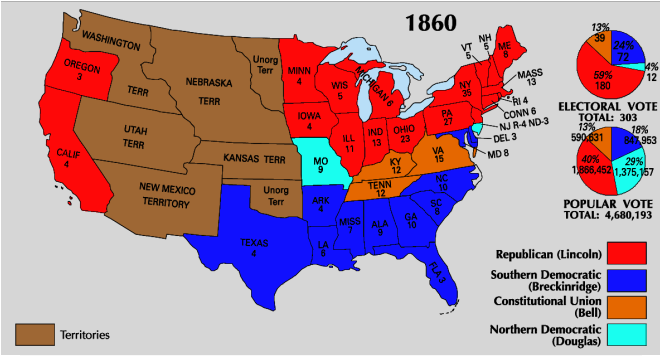 Except for New Jersey and Kentucky, Lincoln won all of the North and West. "The number of northerners for Breckinridge was minuscule, and the number of southerners for Lincoln probably would not have filled any self-respecting tavern." Harold Holzer reflects on how close the election really was. Lincoln is elected president of a divided country headed for war. Would united Democrats have beaten Lincoln? It is debatable whether Democratic and Constitutional Union fusion would have changed the results. "If you go county by county, district by district, Lincoln would still have won the free states [with a united Democratic Party] and thus, the election. But such purely mathematic accounts don’t take into account the momentum of campaigns. I personally think he would have lost."